World Unity, Inc. seeks to make a continuing and lasting contribution towards the elimination of all forms of racial, ethnic, gender, religious and cultural bigotry, prejudices, discrimination and biases. 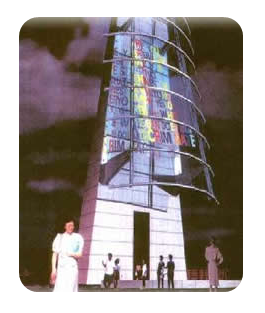 We envision the construction of a permanent landmark with an inscription of the Sun Poem will help promote Diversity and achieve this vision. In l985, The Sun Poem was the centerpiece of a public service campaign to promote racial and ethnic harmony throughout the city of Boston. A multimedia campaign publicized the poem on television, radio, the mass transit and on billboards throughout the city. The campaign was so successful it was also initiated in New York City and Providence, RI. in the late 80’s. In New York City the campaign brought together five racially diverse non-profit organizations to sponsor the campaign, The National Puerto Rican Forum, The New York Urban Coalition, The Chinatown Planning Council, The American Jewish Congress and The National Conference of Community and Justice. For the first time the public service message was aired nationally on CBS and ABC network television and radio. The campaign was so successful it was also initiated in New York City and Providence, RI. in the late 80’s. In New York City the campaign brought together five racially diverse non-profit organizations to sponsor the campaign, The National Puerto Rican Forum, The New York Urban Coalition, The Chinatown Planning Council, The American Jewish Congress and The National Conference of Community and Justice. For the first time the public service message was aired nationally on CBS and ABC network television and radio. The sponsors also launched a city-wide poetry contest inviting students to write their own poems of racial and ethnic harmony. In l986, the poem was the inspiration for the creation of The Sun Poem Workshop. The workshop is designed to use poetry, creative writing and oral expression as a way of sensitizing students to appreciate differences in people. Through grants, hundreds of children in public and private schools throughout the Commonwealth participated in the workshop. The workshop has also been presented at national conferences. The Sun poem has also been kept alive through a graphically designed poster. Over 20 colleges across New England prominently displays it as well as many public schools throughout Massachusetts. It is also displayed in many city and state facilities such as the Boston Housing Authority as an educational tool to promote racial and ethnic harmony. In 1993 World Unity, Inc. was founded. The mission of the organization is to make an enduring contribution to the elimination of all forms of prejudice, biases and discrimination. 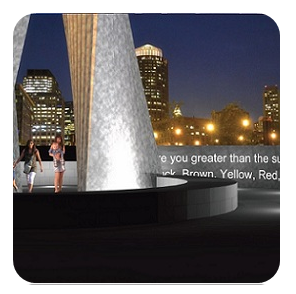 We believe the construction of a landmark with an inscription of The Sun Poem will help achieve this vision. It will be a permanent symbol impacting the present and future generations with a timeless message - we are all part of the human family.